After 3-5 days, the second stage of raising monarchs begins...a tiny caterpillar emerges (below left). The first sign of this event are small "scratches" on the milkweed leaves. You can leave the caterpillar in the plastic container for a few days. 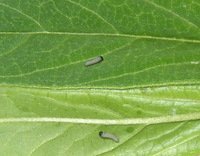 When you start to see lots of little droppings (frass), transfer the caterpillar to a stem of milkweed leaves. I usually tear off the leaf around the caterpillar and put this on a stem of leaves. tropical milkweed plant , started from seed, may be used instead of cut stems (one plant per caterpillar). 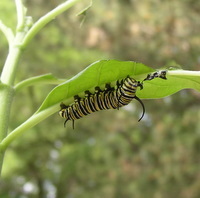 You will notice that the Monarch butterfly caterpillar remains very still for long periods of time. This is when it is molting or shedding its skin (left..notice caterpillar eating its shed skin). 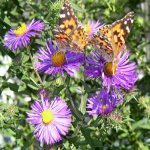 Try not to disturb it during this time in the butterfly stage. This will happen five times including the final chrysalis stage. 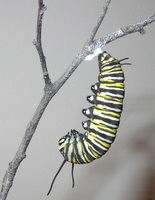 I keep my Monarch butterfly caterpillars out in the open. The only time I have trouble with a caterpillar wondering away from its “food” is when it is searching for a place to shed its final skin. If it does escape, I find it and return it to the milkweed. 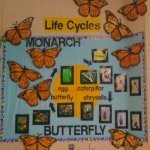 In my opinion, it is worth the effort to keep the caterpillar out in the open so you have a clear view of the complete life cycle of the monarch butterfly. When the caterpillar is ready, in about 10-14 days, it will find a place to attach itself. 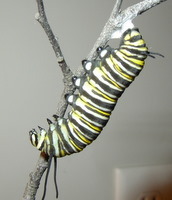 I put some bare branches in with the milkweed as another option for the caterpillar to attach. 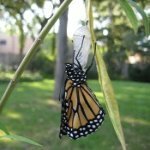 What happens next, is the beginning of what makes raising Monarchs so interesting!! When it finds the perfect spot, it will begin to spin a white “silken thread”. 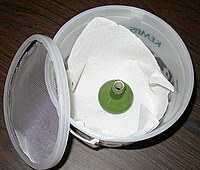 After spinning the thread into a little “pile”, it turns around and attaches its rear to the silken “pile”. Two by two its feet detach from stem or twig until finally it “swings” into the “J” position. 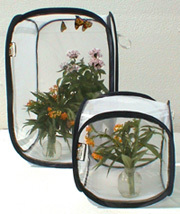 Next is the captivating third stage of raising Monarchs – pupa. This Greek word means “doll”, which denotes a sleeping baby wrapped in swaddling clothes. Egg | Chrysalis | Butterfly!